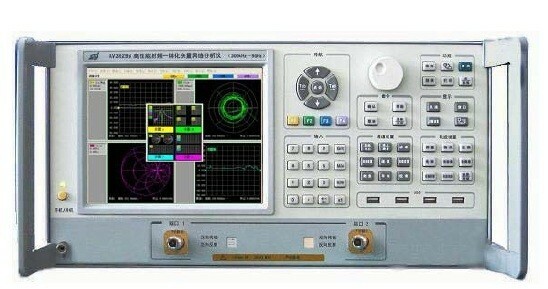 It is the new generation network analyzer of the 41st Institute of CETC,on the basis of years ofexperience in the design of test and measurement instruments.It is designed to provide fastand accurate RF measurement. With its friendly user interface, it is suitable for production line,service workshop, educational training and R&D. It has 32 test windows and 64 test channels(4 traces/channel), which makes it possible to lookat the four s-parameters of two port devices at the same time. This feature allows the setting of an upper and lower limits thus enabling user to identify signal easily. It makes the test of filters with high outband depression possible. The 8.4-inch TFT color LCD provides a clear, bright, sharp display with a 640 x 480 pixel activedisplay area viewable in high ambient light conditions. The vector network analyzer is fitted USB interface for storage of information. GP-IB, USB and 10/100Mbps LAN interfaces are provided as standard. This allows thenetwork analyzer to be integrated into ATE system and the print out of screen displays.